Wharfedale Technologies Inc. (WFT), a leading professional IT services consulting firm specializing in cloud system infrastructure integration and operational management services for enterprise customers, today announced the successful delivery of one of the largest SAP HANA® tailored data center integration (TDI) implementation for a government agency in the Kingdom of Saudi Arabia. 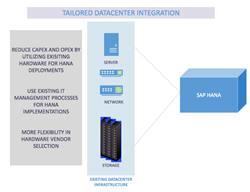 Helping customers reduce CapEx and OpEx by leveraging existing hardware for HANA deployments. Wharfedale Technologies (WFT) today announces the successful implementation of one of the largest SAP HANA tailored data center implementations, performed on converged infrastructure, as part of a SAP greenfield implementation, for a Saudi Arabian government agency. WFT has multiple specialists who are certified in SAP HANA technology, in performing installations, and helping customers by designing and deploying high-availability and disaster-recovery solutions for SAP HANA tailored data center integration. Leveraging its deep infrastructure and SAP application knowledge, WFT carried out the SAP HANA TDI implementation in an industry record time. The results of this implementation has enabled this government agency to take advantage of the in-memory technology that lets users explore and analyze all transactional and analytical data in real time from virtually any data source. Wharfedale Technologies Inc. (WFT Cloud) is a leading technology consulting firm specializing in infrastructure integrations and services for SAP® solutions, as well as private/public/hybrid cloud solutions. As an SAP-certified provider of cloud and hosting services, Wharfedale also offers solutions around high availability, disaster recovery, advanced sizing for virtualization, backup/recovery integration, systems refresh automation and landscape optimization. For more information on Wharfedale Technologies and WFT Cloud services, please visit http://www.WFTCloud.com or call us at (888) 533-3113. SAP, SAP HANA and and other SAP products and services mentioned herein as well as their respective logos are trademarks or registered trademarks of SAP SE (or an SAP affiliate company) in Germany and other countries. See http://www.sap.com/corporate-en/legal/copyright/index.epx for additional trademark information and notices. All other product and service names mentioned are the trademarks of their respective companies.